Retired psychotherapist Megan Hale provides insight into self-acceptance and living a happy and fulfilled life every day. 00:00 Beau Henderson: I’m very excited today because you know a lot of the things I talk about are around not just the money but the bigger picture, and a lot of that revolves around our behavior, and how about this: I’ve got a retired Psychotherapist with us who is now an enoughness coach. Megan Hale, I want to introduce you to RichLifers out there. Welcome to the RichLife show. 00:22 Megan Hale: Thank you, I’m so excited to be here. 00:24 Beau Henderson: So what in the world… My first question, and I’m guessing other people have this question, is what in the world is an enoughness coach? 00:33 Megan Hale: Yes. So enoughness is a work that found me this year, and I really noticed that I had found myself on this more train, and I’m sure a lot people can relate, of needing to do more, and become more, and achieve more, and make more, and it seemed like there was never an end in sight. So I really started looking at this pattern of what was going on here, and how was I defining enoughness for myself, and I realized that if I didn’t change the definition, I was always gonna be on a chase and never actually experiencing the fulfillment that I was really after. So that’s what I help my clients do now. 01:11 Beau Henderson: No I love that, and that’s something I’ve seen for years, and it just pervades every area of our life; our relationships, our health, our finances, that I’m not ‘blank’ enough. 01:24 Beau Henderson: And so often I see that if we ask why enough, we come to that core. Somebody has that. Now is this is a… Where does this come from? Is this a belief, or is this something we tell ourselves, something somebody told us? How does this come… Why do we have this issue of believing, “I’m not ‘blank’ enough.”? 01:47 Beau Henderson: I love it. Let’s do it. 01:48 Megan Hale: So just hang out with me. You know when we’re all growing up, by the time we’re about five or six, we’re really intelligent enough to start forming a lot of ideas about who we are, and how the world works, and how we get our needs met. And during this early time of development, we’re really creating definitions of what it means to be happy, what it means to be successful, what it means to be loved, what it means to be fulfilled, and we create these beliefs around who we think we need to be in order to reach all of these things. The problem is that our mind is still very young, and it doesn’t understand everything about the world, and so it’s really common for us to perceive certain situations or certain information and have some sort of distorted definition of who we think we need to be. And so what you normally see is we feel like we might need to be perfect in order to be enough, or we might have to be the best at everything in order to be enough, or we might have to win validation from everybody in order to be enough, and these things carry on into our adulthood. 02:55 Beau Henderson: Well, let’s do this. I want to dig deeper because there’s levels we need to dig into, Megan. 03:01 Beau Henderson: But I’d like to pull out just some pieces. Honestly, I’m going to use these for promos to get people to say, “Hey, I need to find out more about this.” So if you had a person that showed up and they said, “Megan, I understand what you’re saying. I probably have some issues of these enoughness beliefs, or not being enough,” and you have one minute, what kind of kind of advice would you give that person? I call this a RichLife Minute. It’s kind of your golden nugget in a minute. 03:31 Megan Hale: One minute. I would first tell them that all of the beliefs that they’re carrying about them not being enough are something that they’ve created, it’s nothing that’s real. It’s something that has been carried with them for so long that it feels very true, but that’s not their authentic truth. 03:52 Beau Henderson: Hey, I like that. That’s… I like it… We can even do 30 seconds, it’s even better set. That is perfect. So there’s gotta be levels here. So okay, I see this, I’m with you, I’m tracking. I agree there’s probably some things in me holding me back, how do I arrive at this place to where I’m actually saying to myself and believing it, that I am enough? 04:13 Megan Hale: This is where it comes into rewriting the stories, and we all have stories that we carry about who we think we are, and who who we think we need to be, and how the world works, and all of these things. So the first thing is really becoming aware of the stories you’re telling yourself, which is the process I take my clients through. Really digging deep into, “Why do you feel like you need to achieve so much in order to be enough? Where is this coming from?” And, you know, that could come from all kinds of different places of, “Well, you know, when I was little, I only got a hug when I got first place.” Whatever that means, and so we interpret this and we carry it forward. So it’s really about getting in touch with the stories that we’ve created, and then looking at them from a very much more mature, compassionate lens that we have now to rewrite the story in a way that gives us freedom to let that story go. 05:19 Megan Hale: I absolutely agree, yes! 05:22 Megan Hale: But the thing that’s so interesting about this, and I’m not sure where this comes from, I’m still digging at it myself, but somewhere along the line we have made it very comfortable for us to criticize ourselves, and a lot of our stories are based on criticism. So the process is really allowing validation and praise to become stronger than criticism, and that will literally, I mean, totally change your life. 05:50 Beau Henderson: Well… And this is getting into… See, I knew we were gonna have this. I hope people track because two people fascinated with behavior can be a fun conversation, to us anyway. [chuckle] This idea of… So say I do have a belief and it’s negative or criticism about myself, does it make sense that our brain actually goes to make that true and we actually kinda self-fulfill and show up being true to that criticism because we’re telling ourselves that? 06:56 Beau Henderson: Right. They’re checking you out. 07:00 Megan Hale: It’s like a totally different response. 07:01 Beau Henderson: Well, and that’s funny because, see, that person could’ve actually thought something weird or criticism, but if you tell your… If you actually believe, “Hey, they’re checking me out,” you walk away still with a positive maybe uplift or a boost. 07:15 Beau Henderson: I love it. So say that… How do we really lock this in, meaning… So I understand I need to change the story. Is it just a thing that practice makes perfect, or I need to test and test until I find one that really resonates and it works, or what’s… I’m still in this arriving piece here, trying to get to… On that process, what’s the way just to get better at this? 07:39 Megan Hale: Sure. So I think that for all of us, we have to do the work of rewriting the stories, first and foremost. This is very critical. But that’s not enough because criticism is very ingrained in many of us, and we can’t just tell our brain to stop doing something without replacing it with something new. Our brain doesn’t understand that. So the antithesis to criticism is compassion. So it’s really replacing this critical self-dialog with a compassionate one over, and over, and over again. And I honestly think it’s a lifelong journey of practicing self-compassion because we can be outside of our comfort zones, especially when we’re going after big dreams, especially when we’re like, “I’ve never done this before. Can I really do this?” And those ‘not enough’ thoughts might come up again. So we can never really get rid of them completely, or at least I haven’t experienced that yet. So the practice of self-compassion is really such a huge tool to being able to combat those feelings whenever they arise. 08:43 Beau Henderson: So we really… The goal, Megan, it seems, is to just get better at being able to replace those critical thoughts with compassion for yourself. 08:54 Megan Hale: Absolutely. And I think also like during the work, when you have a big shift in a story and you realize it wasn’t exactly how you saw it back then, the story starts to lose its power anyway. And so it becomes a lot easier to replace these stories with more compassionate dialog along the journey of it. 09:12 Beau Henderson: So it sounds… It’s almost like a habit or a muscle. I don’t know which is a better analogy. 09:15 Megan Hale: Oh, flex it. Yeah. 09:18 Beau Henderson: Yeah. The more we use it, the better we get at being able to just go down that path that serves us versus one that’s maybe been harming us for a while. So say I get pretty good at this. Is there any danger in somewhat of an arrival syndrome? Saying, “Okay, I’m good at this,” and then you kind of maybe, with that set-up conditions of, “Okay, I am enough,” and if you’re not vigilant, that it sneaks back in the back door and all of a sudden you’re having issues again. 09:45 Megan Hale: Absolutely. I mean, any time that we feel like we’re not enough, we’re going to usually fall into some sort of pattern that prevents us from feeling that way. So one of the things that I work with, especially with high-achievers, is this need to avoid that feeling of not enough by doing more, by becoming more. And it’s almost like we have to prove something to ourself, that inner critic, of saying, “Oh, you don’t think I’m enough? I’ll show you. Watch me go and make this much money or do these things,” and it can become this habit that is just never fulfilled because there’s always more to do and more to get and more to become. And so we really have to watch those messages and how we’re relating to them because if we’re trying to prove something to ourselves with more, more, more, there’s always gonna be more. 10:35 Beau Henderson: Well, you know, it sounds like… It’s a great message for the RichLife show because think about this, it sounds like the example of what happens a lot of times, and I can completely resonate with this, especially in my younger days, is you try to earn enoughness. You try to earn it, and maybe we just need to accept that we are. 11:32 Beau Henderson: That’s right. You accomplish something, and then there’s whole new people, whole new levels, whole new situations for you to have a whole new not enough-isms. 11:42 Megan Hale: Yeah, absolutely. And, you know, I kinda wanna highlight this fear that comes up a lot for people when we start talking about enoughness. It’s like, “But aren’t we supposed to become our best selves? And aren’t we supposed to continue striving? Aren’t we supposed to stay hungry?” My answer to that is, “Of course.” And enoughness doesn’t change that. It just simply changes the way you experience it. Instead of needing all of these things, it’s just something that is like the icing on top. You don’t need it, you naturally expand into it because enoughness really encourages you to become more of who you are. And when you become more of who you are, your purpose naturally expands and you naturally expand to serve that purpose. 12:21 Beau Henderson: Again, we’re just intertwining perfect conversation for the RichLife Show because it is that idea of maybe… Maybe as we just get crystal clear on what makes our life meaningful, not somebody, not my parents, not my spouse; what makes my life meaningful and I focus on doing that really well. 12:41 Megan Hale: Absolutely. Yeah. 12:43 Beau Henderson: Perfect message. Okay, so I’m getting better at this. I’m getting some skills at enough… Being enough. Enoughness. And I understand it’s a life long, but is there any other tips to maintaining that second level? 13:00 Megan Hale: Yeah, mindful is really, really important. Gratitude is very important. When we lose track of what we have right now, we can no longer be grateful for it if we’re always thinking, “Well, this could be better. This should be more,” whatever that is. And we’re really discrediting the person that we are right now, the people that are in our life right now, the life that we have right now, all of our accomplishments that we have right now. We discredit them when we are like, “These aren’t good enough.” So being really mindful and practicing gratitude are two very huge components to this for sure. 13:38 Beau Henderson: No, I love that. So, you’re just speaking my language, Megan. I love this. One of the big things that was very eye opening, and a realization over time for me, was that if I was grateful for what I had, the things that were already good in my life, I would actually be creating the most favorable conditions to create more of that. But we’re kind of hardwired to do almost the opposite, it’s why you do the work you do and I do, too because we’re almost hardwired to think first about what we don’t like, what’s not going great, and we do the inverse. We do the same thing, we actually create that. 14:15 Megan Hale: Yes. Yeah, we attract what we’re thinking about. 14:21 Beau Henderson: Well, somebody that might need some help with this… And see, I think you brought up a good point that people need to hear, is you work with some high achievers on this stuff. It’s not just the person that’s struggling to break out of a hard situation or getting started, this goes on. This goes across the spectrum, this feeling, it pervades probably from young kid to the grave in some cases. 14:45 Megan Hale: Yeah, it’s a very human quality. 14:47 Beau Henderson: So, what would be on that high achiever… And there’s somebody out there… And they can be anywhere in that spectrum, if they wanted, and said, “Yes, I would love to break this down or maybe be able to have some tools to strengthen my muscle to be better at this,” how could they… Do you have anywhere they could maybe reach out to you or anything you’d like to share with them to be able to learn a little more and dig a little deeper than we have time to on our 20, 30-minute show? 16:06 Beau Henderson: I’ve got things to do. 16:06 Megan Hale: Yeah, it’s like, “Come on.” But the minute that I realized that fear… It’s a fear that was really guiding me. The fear of missing out, the fear of not getting there, the fear of not being successful, the fear of not arriving, that this was the thing that was driving all of my actions. I said, “I don’t wanna give fear that much power anymore,” and so I decided to do the exact opposite of what I felt comfortable doing, and that was to slow down. And what I found was that there were so many opportunities every single day to feel fulfilled, to feel joy, to feel deeply satisfied. And you know what happened to my creativity and to my inspiration? It became so much more laser focused. Instead of chasing all of these shiny objects outside of myself to feel enough, I knew that I was enough as I was. And so I started focusing on just the things I was really meant to do and that’s when life completely shifted to being able to serve my purpose in a much deeper way, a much more fulfilling way, and a much bigger way. And I had to do the exact opposite of what I thought I needed to do in the first place to get there. 18:02 Beau Henderson: In the journey. 18:04 Megan Hale: Oh, yeah. Absolutely… That’s all we have. That’s all we really have and that’s the thing that blows my mind is that for so long I was living for some future destination that I didn’t have yet and it was never guaranteed. All that we have is what we have right here. 18:19 Beau Henderson: That’s right and that mindset, that was a big mind-shift for me is, you know, I don’t know. I could get hit by a bus in a month. 18:38 Beau Henderson: So yeah, so people interested, is there a way, Megan, that they could maybe reach out to you or go to the website? Let me know the best way for people to find out a little more. 18:48 Megan Hale: Absolutely. 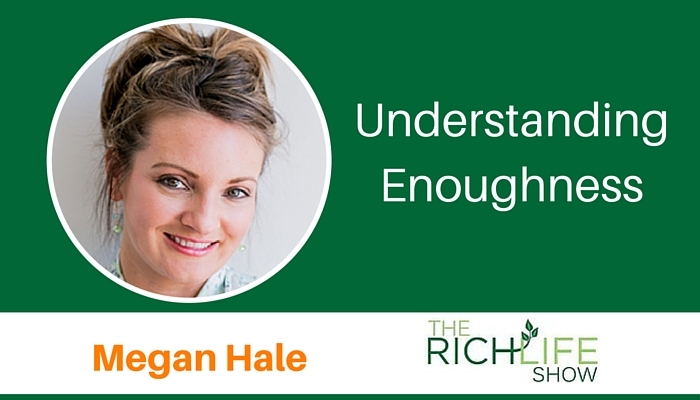 You can visit me at my website, it’s megan-hale.com, and there’s a podcast out where I talk about enoughness, it’s called ‘The Enoughness Revolution’, would love for you to tune into that as I talk to some amazing people about what it takes to become enough and stay enough as we continue to go after our potential. 19:07 Beau Henderson: This conversation has been fascinating, one of the things I like to make sure I ask our guests is on your journey, Megan, I have this concept I called life school that I believe life will often teach us lessons that might not be fun, but we need to learn them to move to the next class or move on our curriculum in life. Did you have a lesson on your journey that was maybe a crucial thing to learn, maybe at the time you wouldn’t have chose it but it was exactly what you needed to learn, that might be a lesson to help some of our listeners? 19:40 Megan Hale: God, there are so many. There are so many. 19:44 Beau Henderson: What’s funny, Megan, is that I talk with a lot of entrepreneurs and we all have so many of those life lessons. 19:49 Megan Hale: Yeah, I think when you’re awake and you’re paying attention and you’re really in tune and you crave to just be your best self and to be your full self, to live life fully and to not hold anything back, I think there’s just so many opportunities for growth and that… I would say that one of my most recent lessons is really waking up to the fact that my productivity, having to do something all the time, being very busy, was a way of me avoiding how I really feel and almost trying to shut of the emotional quality of myself and I realized that by not allowing my emotions space to be with me, I wasn’t living from my whole self. And, you know, to get into a little bit of spirituality here, I really do feel that our emotions are the language of our soul. It’s how our soul communicates to us about what we’re supposed to do and how we’re supposed to do things and when we’re not in touch with that, it’s really difficult to live a fully authentic life because we’re cutting off the communication supply. And so for me, the whole process of slowing down was really giving my emotions a space to live with me and bring them to the table. And what’s happened in my case is I just feel like I’m living from a place that’s much more whole, much more complete, much more full, and much more me, and I think that that is something I would never, never be able to put a price on. 21:20 Beau Henderson: Now that’s a powerful lesson. Replace the busyness with maybe quietness? How do you do that? Is that something… Is it just making sure you’re creating time to maybe be quiet and… ‘Cause I know so many of us, we’ve gone years and years and not just actually been still and quiet. 21:43 Megan Hale: Oh yeah, yeah. And, you know, quietness is such a huge piece of it and there’s also an experience of learning how to feel your feelings. I heard something beautiful the other day, it said, “Feeling your feelings is an act of self love,” and I just loved that so much. It touched my heart. But really being able to let your feelings rise and what they feel like in your body and tuning into this whole different layer of yourself and this awareness and being quiet and slow is so necessary for that. 22:13 Beau Henderson: Couple more questions I wanna just get to… Well, no, I have one I thought of. I don’t usually ask this question but because we have such similar interests, I’m just selfishly interested. A recent or a favorite book that you love and why, because I have a feeling I’ll like it anyway so that’s why I’m asking you. 22:31 Megan Hale: So, my favorite book right now is ‘BIG MAGIC’ by Elizabeth Gilbert. She talks about how to live a creative life beyond fear and she talks about specifically the relationship we have to have with fear. And for a very long time I was on this goal to eradicate fear; just make it go away, I don’t wanna feel it, “Why are you here? You plague me, take me away from, you know, my confidence and all of these things.” But the journey of enoughness has really been learning how to have a completely different relationship with that inner critic and the fear itself. And I think Elizabeth Gilbert gives so many beautiful words to that journey, and she’s just so raw and real about what it’s like to live a truly powerful, creative life and the fear that coincides with it and I just love it. 23:22 Beau Henderson: Love it. I love Elizabeth’s work. I haven’t read that one though, so I’ll have to check it out. Now here’s another one I just thought of when we were talking. One I just finished, Megan, was ‘The Power of Habit’ by Charles DuHigg. And the reason I really liked that… It reminded me as we were talking about just kind of rewiring some things to get better at the habit of that compassion as opposed to criticism, so might even… Okay. Best money advice you’ve ever received and from who? 23:48 Megan Hale: Best money advice. Money doesn’t dictate your worth. 24:00 Megan Hale: And that’s something one of my coaches told me. That was something I believed for a really long time, but I’ve really let that go and I’ve redefined that for myself. 24:10 Beau Henderson: Best advice for general success in life, and who did you get that from? 24:16 Megan Hale: In order to be successful, anything, happy, fulfilled, anything, you have to be you. And you have to cultivate a space where the true you can continue to shine and to not dampen it in any way. Your authenticity is your key to everything you could ever want in life. Everything. 24:39 Beau Henderson: Now, no limits, no boundaries, Megan, what would be your definition of a rich life? 24:47 Megan Hale: Oh, I love this question. A rich life, to me, is being able to fully experience every single moment. All of it. All of the good things, all of the bad things, and just being able to receive it in a very loving and open way. And having the faith that everything is working in my favor at all times. 25:08 Beau Henderson: Perfect. Now Megan, you’ve delivered above and beyond what I promised at the beginning of the show. We have given people actionable things that they can work on that will help them. So you have honestly made our lives a little richer, and I wanna thank you for that. And I hope you’ll come back and join us ’cause I’m having a blast talking behaviour, enoughness, and all that. So I hope you’ll come back and join us in the future. 25:31 Megan Hale: Oh yeah. 25:32 Beau Henderson: And RichLifers, I’ll have the information, the bullet points for Megan, and we’ll see you next week. Same time, same place, right here on The RichLife show. Megan Hale, MA, BCC is a happiness and fulfillment coach for high-achieving women who are stuck in self-defeating patterns of “never enough” and are ready to be enough as they are, where they are. Prior to becoming a Board Certified Coach, Megan received a Master of Arts in Clinical Counseling from The Citadel in Charleston, SC following a Bachelor of Science in Psychology from the College of Charleston. She has previous experience as a cognitive behavioral therapist owning her own private practice, Seek the Good Life, PLLC, in Wichita Falls, Texas where she helped men and women overcome depression, anxiety, and relationship issues via an integrated approach including cognitive-behavioral therapy, interpersonal therapy, mindfulness based therapy, and spiritually oriented psychotherapy. Megan most recently founded Megan Hale, LLC, her virtual life coaching practice, to specifically help women find their authentic voice and define happiness, success, and fulfillment on their own terms, thereby claiming their enoughness. She’s also the founder of the live true movement, a lifestyle philosophy that helps women embrace who they are, where they are, and claim their ‘enoughness’ now. Her work has been heavily influenced by Dr. Brene Brown’s work on vulnerability and her 10 guideposts for Wholehearted Living as well as Dr. Roger Walsh’s work on creating Therapeutic Lifestyle Changes (TLC’s) to increase overall wellbeing. She seamlessly integrates cognitive coaching, positive psychology and mindfulness based approaches to help her clients find happiness and fulfillment now versus postponing it to someday.